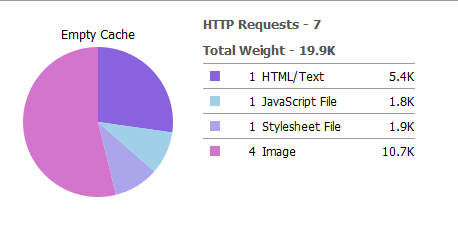 Each of those are extra HTTP requests, and each unique request takes a relatively long time. The fewer requests to the server that the browser has to make, the faster the page will load. 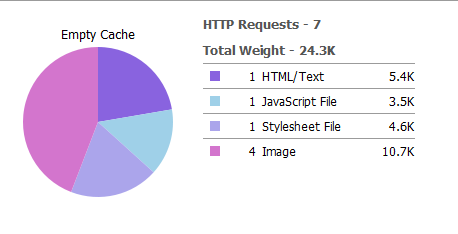 There is an inherent overhead in each HTTP request. It takes substantially less time to serve one 60K file than it does three 20K files and a lot less than it does six 10K files. To keep the modularity that comes with splitting these files out by section (or business unit), keep them split in your development process, and combine them in your build process. A first Ant task will combine them and a second task will generate their minimized versions. This technique has been successfully used in libraries such as jQuery, MooTools, Dojo, ExtJS, YUI, etc, allowing developers to better organize their code. Ant is a Java-based build tool. In theory, it is kind of like Make, without Make’s wrinkles and with the full portability of pure Java code. The YUI Compressor is also able to safely compress CSS files. The decision on which compressor is being used is made on the file extension (js or css). Download this build example source code. The build folder contains all the files needed to build the project. The src folder contains all the project source files. Finally, the build.xml file is the Ant build script. Here’s where you configure your project build process. Let’s take a look at the project build.xml script. Now that you know the file organization and the build script details; the next step is to execute the script and have the production code ready to be deployed into your hosting/server. If you take a look at the header section of the index.html file you’ll see that I’m only using the style.min.css and samaxesjs.min.js files. The following images are screenshots taken from the YSlow Statistics’ report comparing the debug and minimized versions. As you can see the compression gains are quite considerable.